Everyone keeps asking me if I’m excited to leave for Paris. I’m in Paris for a day between flights en route to Djibouti. It makes me chuckle because I’m not really traveling to Paris, I’m traveling to Djibouti. But the average American is much more familiar with the idea of Paris and I suppose Paris is easier to understand. Last week when my traveling companion and I received our visas, I felt a thrill. And when I check the weather… It’s 90 degrees in Djibouti with an 18 mph wind and 62 percent humidity that creates a heat index of 100 degrees. That’s a tad scary. But no. Now, I’m not excited. Three weeks ago today I broke the fifth metacarpal of my right (dominant) hand. This has provided some challenges and some frustrations. Many of these challenges I believe I conquered but certainly the manual can opener still stands between me and that tuna fish sandwich. 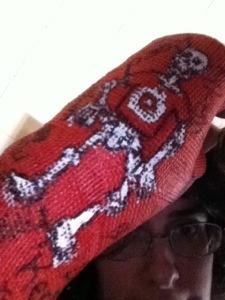 So what makes me excited is the fact that tomorrow the doctor’s staff will remove my rockin’ red cast. I did attempt to pack yesterday and I’d like to review my choices today, but the cast makes folding near impossible. I may just save that until tomorrow. I also broke the camera I planned to take with me so that lead to some scrambling. I will practice my hijab today. I have booked a haircut for Wednesday. When I know the status of my broken hand, then my attention will shift to the trip. Then I shall be excited.